Nexus Holidays - China Panorama & Yangtze River 17 Days 2019NEW! This is an ideal trip to visit the essential historical and culture sites while enjoying some magnificent natural landscape of CHINA. You will start your trip from the vibrant city of Shanghai and then visit the beautiful surrounding garden cities. Later take a relaxing Yangtze River Cruise to Chongqing, which is the best way to sweep away the exhaustion of the trip. In Chengdu, you will get up close to the adorable giant pandas and then take the bullet train to Xi’an to witness the man-made wonder- Terracotta warrior. In ancient capitals of Beijing, you will uncover the best collections of historical sites, such as Forbidden City, Great Wall and Summer Palace etc. Shanghai is the vibrant metropolis and commercial center of China. Today we will visit the Shanghai Museum and indulge in ancient Chinese art, furniture, and jade. Then we will visit Shanghai Old City God Temple area, a busy shopping centre where you may find souvenirs and delicious local food. Enjoy some free time here. In the afternoon you will walk along the famous Bund, a mile-long stretch along the Huangpu River. Lined by the colonial architectures of European design, this area is the best place to capture the western influences of the old days. At night, you may enjoy an optional "Huangpu River Night Cruise" and get a glimpse of the dazzling and charming night view of Shanghai at your own expense ($50/RMB250). After breakfast, we will visit Zhujiajiao Ancient Water Town, which has almost 1,700 years of history. Walking on the zigzag stone pathway, you would feel like walking in an elegant and fresh painting. Small rivers shaded by willow trees, bridges over the river, houses dated back to the Ming and Qing Dynasties, lovely local people, all of these are the charm of the small water town. Then travel by coach to Suzhou. Suzhou is also known as the “Garden City” due to its many classical gardens. Upon arrival, visit the Lingering Garden which is among the finest gardens in China. As a large area of the city is covered by water, including a vast number of ponds and streams, Suzhou is known as “Venice of the East”. You may take an optional cruise along the Grand Canal to view life along China’s golden waterway in its heyday ($30/RMB160). This morning, visit a Silk Spinning Mill, and learn how silk is created from mulberry-munching silkworms to produce the finest thread and cloth. 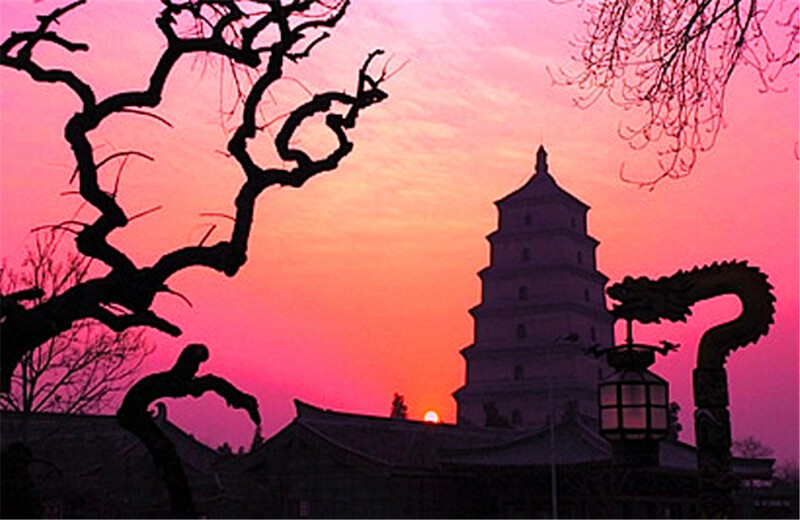 Then travel by coach to Wuxi, one of the oldest cities in China with history of more than 3000 years. Upon arrival, head to admire the famous Lingshan Grand Buddha, with a thousand-year old Buddhism temple nearby. This morning, visit one of the largest Fresh Water Pearl Exhibition Store in the country, then travel by coach to Hangzhou, described by Marco Polo as “the most beautiful and magnificent city in the world”. Upon arrival, visit the serene West Lake, the most renowned feature of Hangzhou, noted for its scenic beauty which blends with many famous historical and cultural sites. This evening, you can enjoy an optional performance, “Enduring Memories of Hangzhou”, a masterpiece created by Zhang Yimou, the director of the 2008 Beijing Summer Olympics Games Opening Ceremony. ($90/RMB540). Disembark from the cruise in the port of Chonqing this morning. Then take the bullet train to Chengdu. After arrival, we will explore the dynamic folk custom street, Jin Li, and experience the lifestyle of Old Chengdu. This evening, you can watch a fascinating show featuring ‘face changing’ ($55/RMB300), a kind of magic traditional Chinese dramatic art that is the pride of Sichuan opera. Today’s highlight is a visit to the Chengdu Research Base of Giant Panda Breeding. This is the best place to see Chengdu’s most famous residents being reared in surroundings resembling their natural habitat. Here you may get a chance to see the new-born baby pandas. This afternoon, we will take the bullet train from Chengdu to Xi’an. Xi’an was the first Chinese City to open its doors to the world during the Tang Dynasty. Over a period of more than 2000 years, Xi’an was the capital of eleven dynasties. 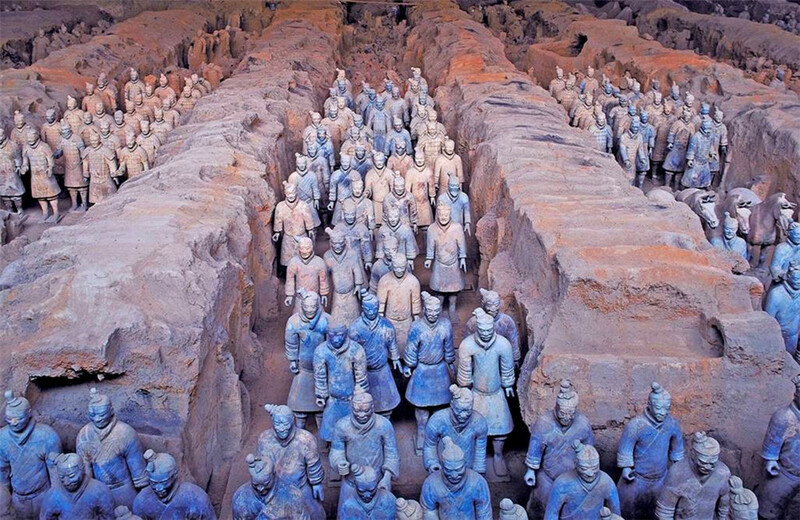 After breakfast, you will visit the Terra Cotta Warriors and Horses Museum and see the attached life-sized defending army to the first emperor of China, Qin Shi Huang. This site is regarded as “the eighth wonder of the world” and is among the top archaeological excavations of the 20th century. Visit an Art Ceramics Factory before we visit Ancient City Wall. 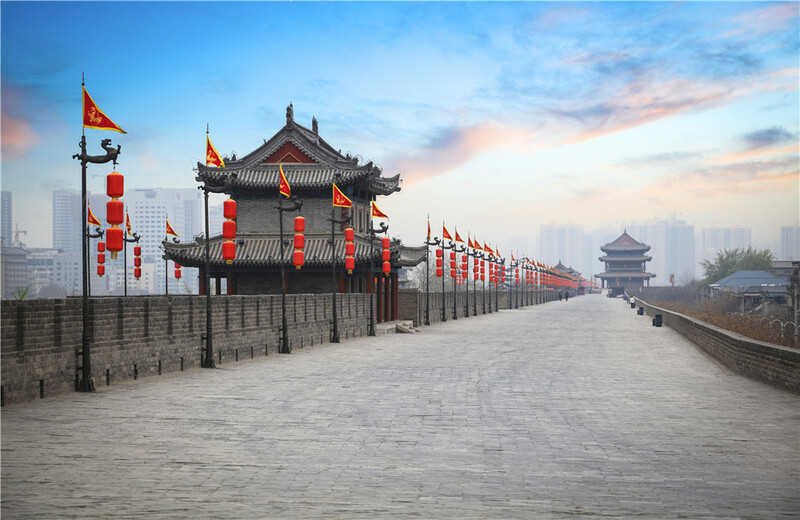 It is not only the most complete city wall that has survived in China, but also one of the largest and most complete ancient military defense systems in the world. This evening, enjoy the “special local Imperial Dumpling Banquet Dinner and the traditional Tang Dynasty Singing and Dancing Show” ($70/RMB360). This morning, fly to Beijing. Beijing has served as the capital of five dynasties over a period of 800 years. Today, visit Tiananmen Square, the second largest public square in the world, and the Forbidden City, the Chinese imperial palace from the Ming to Qing dynasty. Your banquet includes the local delicacy, Peking Roast Duck. Enjoy the day at leisure or join an optional Temple of Heaven & Hutong Life tour with Dinner($79/RMB420). Temple of Heaven, inscribed as a UNESCO World Heritage Site, was visited by the Emperors of the Ming and Qing dynasties for annual ceremonies of prayer to Heaven for good harvest. Then take a famous rickshaw Hutong Tour & Local Family Visit, this package also includes a traditional Beijing Zhajiangmian(‘Fried Sause Noodles’) as Dinner. Hutongs are traditional alley ways that made up Beijing’s old city planning, take a special rickshaw ride for an immersive tour to get a wonderful glimpse into yesterday’s world, the old way of life and traditional Beijing culture, and see the dramatic changes the city has undergone continue to visit a local family . Today’s highlight is an excursion to the majestic Great Wall, the most famous image of China, and a chance to climb a portion of this 3,700- mile marvel. Visit one of the largest Jade Exhibitions in Asia en-route before the Great Wall. After lunch, see skilled artisans at work at a Cloisonné Factory. Then we will drive pass by modern exteriors of the Bird’s Nest and Water Cube. Tonight, you can choose to attend an optional large scale dramatic musical, “The Golden Mask Dynasty” ($65/RMB340). Start your tour the exquisite Summer Palace, the largest preserved ancient imperial garden in China, and a former summer resort for Emperors. Then, visit a Chinese Herbal Institute to learn about traditional Chinese medicine, which has existed for thousands of years. Enjoy the rest of the day at leisure. After breakfast at the hotel, you will fly back to Canada. Please click on your selected date/ price to book. * Free coffee, tea and snacks at happy hours in afternoon. * Enjoy all meals at VIP restaurant and A la carte available (A la carte need to be paid separately). * Free drinks before dinner. * Unlimited wine, beer and soft drink for lunch and dinner. SPIRAL is a Shanghai style acrobatic show which is created according to the characteristics of proscenium stage. It tells the story of a group of young people occurred in different places of Shanghai, displays Shanghai style and city spirit. It is not only a wonderful acrobatic show, but also the envoy of spreading the culture of Shanghai. The domestic and foreign audiences will follow the artists get in 'SPIRAL' and feeling Shanghai. Overweight luggage in excess of allowances will incur excess baggage charges payable on site by the passenger. For domestic China flights, you may be asked by the airline to pay fees of approximately $2 to $4 per pound in excess of the weight limit. Liquids & gels over 100 ml must be packed in checked luggage at all airports in both Canada and China. Internet access is available at almost all hotels on your Nexus Holidays travel itinerary. You can use the computers in the business center at your hotel for a fee. Internet access is usually charged by minute and may be expensive. Many hotels offer free internet access at your hotel room, so you may want to bring your own laptop, but some hotels do charge for that and it could be expensive (up to $15-18 per day). Wi-Fi is not commonly available in China hotels. Most hotels in China either do not have WiFi at all or only have WiFi in a public area. Usually you will not have access to WiFi from your hotel room. In order to use iPad or iPhone in your hotel room, you may buy an AirPort Express from Apple to convert the internet access from the cable modem to wireless. Your iPhone can roam to China but data roaming could be expensive. sFrom time to time, our qualify control manager in the North American office may contact our customers while they are in China to ensure their China tour is progressing smoothly and satisfactorily. The Chinese currency is known as Renminbi (RMB), literally "People's Money". The basic unit of RMB is Yuan (dollar), which is divided into 10 Jiao (dimes), which is divided again into 10 Fen (cents). Bank of China issues RMB bills in denominations of 1, 2, 5, 10, 20, 50 and 100 Yuan and 1, 2, 5 Jiao. Bronze and nickel coin equivalents exist for the smaller units. As of June. 2011, CAD$1=RMB 6.6, Exchange rate fluctuates daily. Hong Kong's currency is the Hong Kong Dollars (HKD). It is internationally exchangeable and worth slightly less than RMB. Note, Hong Kong dollar cannot be used in mainland China and you must convert all your HKD back to USD or CAD before leaving Hong Kong. Personal checks are generally not acceptable outside North America. Although P. R. China covers five time zones, only Beijing Standard Time is adopted for the entire country. It is 8 hours ahead of GMT, 16 hours ahead of Pacific Standard Time (15 hours ahead of PST in daylight saving time). People in China's far western regions like Tibet follow a later work schedule to keep pace with the official centralized Beijing Time. Please check World Clock for current regional time. Pacific Time + 3 hours, then switch AM and PM. For instance, it is 5 pm in Vancouver, Beijing time is 8 am, the next morning. Eastern Time only change AM and PM. For instance, it is 8 pm in Toronto, Beijing time is 8 am, the next morning. China's electrical current is 220V, 50 cycles AC. Plugs and Outlets come in a variety of shapes and are different from that in North America. Adapters and converters are readily available at all hotels but may be limited to a small number. So if you have to use them in urgency you are advised to bring along your own adapters and converters for your North American appliances. As soon as you check-in, you should contact Housekeeping to borrow adaptors and converters. Hair dryers and irons are readily available also. Blackberry and Iphone can roam to China, but data roaming could be expensive. Check with your phone carrier for their special internal roaming plan. You may also buy a SIM card in China to use on your cell phone if your phone is unlocked. You may also get an unlocked tri-band (multi-band) mobile phone from the States (Canada), and buy a local SIM card as soon as you arrive in China. The cards are prepaid -- e.g. RMB100 will get you quite a bit of talk time and at lower cost than the hotel IDD service. For your convenience, you may rent a cell phone. Please visit Pandaphone.com for details. CAD$10 per traveler per day, shared between all guides, porters and drivers. 1.5 L of wine or 1.14 L of liquor or 24 x 355 ml cans or bottles (8.5 L) of beer or ale. You must be of legal age in the province of importation. You must complete a Declaration Card before entering Canada Customs. Sample Declaration Card. Canada Border Services Agency web site.